Maybe. Generally I treat Blindingly Brilliant, Four O’Clock in the Morning Ideas with high suspicion. Four in the morning is a time for dreaming whimsically of a blurred and innocent youth spent frolicking in bright white,* through overgrown wheat fields, with a floral wreath-thing perched upon long, breezing-in-the-breeze, down-to-the-knees, tresses. ** Four in the morning is not for staring into the dark, brainstorming refashioning notions. During a recent sort-through of anklebiter hand-me-downs, this exquisite, all the way from Paris, size six month baby dress, was one of three items placed to one side. I planned to wrap in tissue, attach a death threat in moth language and haul out a few eons hence for the sentimental dressing of frolicking grandbabes, (refer pic on the left). Unless I make a handbag, (refer pic on the right). The issue is, I haven’t the foggiest how to sew (much). I haven’t any inkling of most of the rules, but manage to bend them anyway. 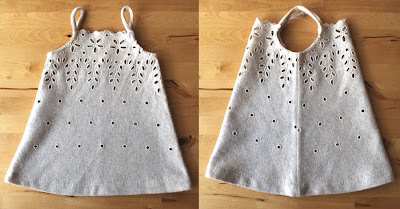 I do know that a lining is the order of the day, even though I do so like the see-through holey bits. I know it’ll be fiddly, but I’m happy to go evenly and patiently by hand. I’m also thinking just-right wooden handles might be the bees knees. So stop me now, you sewers in the know. You may just be able to spare some poor future grandkid an unfortunate experience, gadding about in a wooden strappy number. ** I have only ever owned curly hair. Curly hair in my family never grows longer, just springier. I know nothing but I love the idea of it. I've only sewn a few handbags, so I'm not the girl to answer your questions. But, I think it would be a brilliant bag! Go for it. That is going to be one gorgeous bag, especially with wooden handles...hmm I can picture it already! Do it, do it, do it! Bit of iron-on interfacing, a lovely patterned lining, wooden handles, eat your heart out Prada (or is that a car? Whoever it is that makes bags, frankly I have no idea!). As for sewing rules, pah! The blindingly brilliant four oclock in the morning ideas are always the best! I say "go ahead and wing it" - it'll look fab. What a gorgeous dress! It'll make such a sweet little bag (even sweeter knowing one of your little ones once wore it!). Make a practice bag first ? Wooden handles sound just right with that broderie anglaise .......very Brigitte Bardot ( then , not now ) , summer on the Riviera look . 1. trace the outlines for a pattern. sew bottom edge of dress from wrong side. flip. 2. using your pattern cut out 2 pieces of lining. sew sides and bottom right-sides together. flip to right side. you've got two bags now. 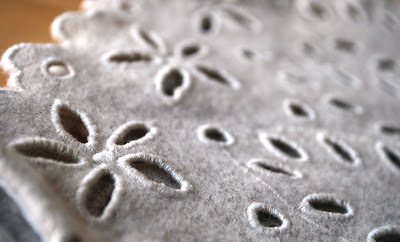 6. sew the top edges together - again using blanket-stitch. keep us all updated on your progress! Most inspired Tania!! Looks like you have already gotten some great tips on how to go about it. Can't wait to see how it turns out. Put down the scissors & leave the dress alone!! Isn't it too cute to cut up? Well, I was all ready to leave a comment about how I would go about it, Tania (I'm with the bag vote), but now all I can say is Go Andrea! How is that for advice?! Keep her on side, babe! Oh you are good at 4am .. real good. Inspired, my friend, inspired. I only think about bills and how I should reboot a fitness campaign at 4am ... will have to start chanelling the goddess of craft instead. Go for it! Hi Tania, so lovely to meet you yesterday! Can't wait to get stuck into your blog and have a laugh and check you out - might even stalk you a bit. Wow, unbelievably beautiful, and as a bag? Just pure genius!! I am agreeing with your other commentors, some wooden handles would look brilliant.